Just add water and serve our savory Vegetable Beef Stew in minutes! 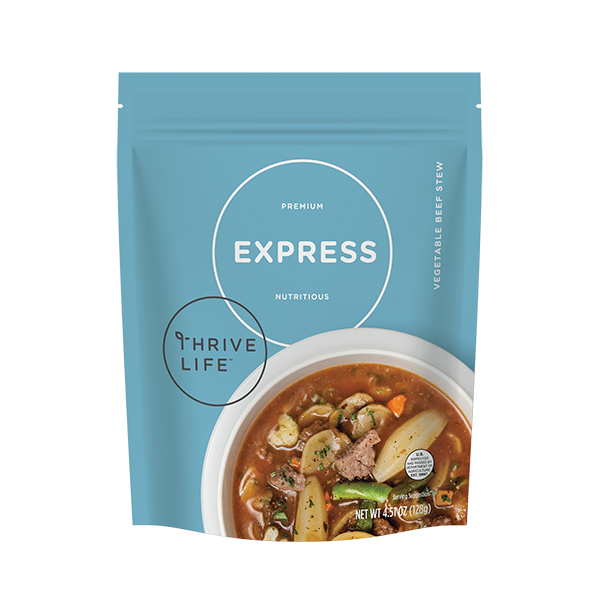 Crafted in the Thrive Life Kitchen and packed with flavor, it's a convenient dinner your family will love. Dehydrated Potato Slices (Preserved with Sodium Bisulfite), Espagnole (Food Starch-Modified, Salt, Potato Starch, Sweet Cream, Maltodextrin, Yeast Extract, Tomato Powder, Sugar, Nonfat Milk Solids, Powdered Cooked Beef, Beef Fat, Dextrose, Garlic Powder, Caramel Color, Beef Extract, Natural Flavor, Guar Gum, Onion Powder, Spices, Xanthan Gum, Sodium Caseinate, Sodium Phosphate, Silicon Dioxide (anticaking agent), Lactic Acid, Calcium Lactate, Annatto Color), Freeze Dried Cooked Seasoned Crumbled Beef (freeze dried beef, salt, flavoring), Freeze Dried Cooked Diced Beef (Beef, Salt), Carrots, Tomato Powder, Food Starch-Modified, Green Beans, Onions, Celery, Red Wine Powder (Glucose Syrup, Solid Red Wine), Granulated Garlic, Peppercorn Blend (Spices, Red and Green Dehydrated Bell Pepper, and less than 2% Sunflower Oil to prevent caking), Italian Seasoning Blend (Oregano, Basil, Rosemary, Thyme, Marjoram, Sage, Savory), Parsley. 1. Bring 4 cups of water to a boil. 3. Reduce heat and simmer 8-9 minutes, stirring occasionally. 4. Let stand for 5 minutes. Season to taste.